You don’t have to do everything at once. Some people thrive by making big changes, starting a full blown workout program and healthy eating plan all at once. Other people are intimidated by making so many changes at once. They do better taking small steps that lead to better health. There are plenty of programs ready for anyone who wants the challenge of changing both eating habits and adding regular exercise, this article is for those who want to take the journey slower. You can begin by throwing out all junk food. Junk food includes highly processed or sugary foods, like beef jerky, donuts, cookies, candy and even fruit drinks fall into that category. As a starting point, cut out soda or fruit drinks first and substitute water. Make it a habit then move on to cutting out other food, like chips or snack food and replace those with fresh fruit or vegetables. Increase the amount of non-starchy vegetables at a meal, make them green, red or orange and decrease the amount of starchy ones, such as potatoes or corn. Move more and build your endurance. 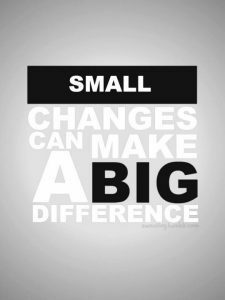 Small changes can make a huge difference. If you take an elevator to your office every day, take the stairs instead. Of course, if you’re working on the tenth floor, it might be too much at once, so just take the elevator up a few flights and the stairway the rest of the way. Build up until you take it all the way. Walk to lunch rather than take a car. If you’re on a computer all day, take a break every fifty minutes. Do whatever it takes to move more. Walking faster and taking longer strides also boosts your endurance. If you’re efforts to move more still aren’t enough to get you prepared for a full program, try three ten minute workouts each day. There’s the notorious seven minute workout and the four minute nitric oxide rush. Both of these are done throughout the day. However, you can also work with a trainer who will create three short workouts for you to do three times a day which add up to a full thirty minute workout. You might find that working with the trainer is so easy that you’ll be ready for full program. Trainers don’t try to push you to do anything your body isn’t ready to do. Instead, he or she will create a program designed specifically for your fitness level and needs. Get more sleep at night. Sleep is often underrated and in some circles, looked upon with disdain. It doesn’t make you a better person to get less sleep, but it does make you less effective, more prone to put on weight and at a higher risk for heart disease. Drink more water. Some of the physical problems faced by people come from dehydration. You can prevent kidney stones and even signs of dementia by ensuring you have 8-eight ounce glasses of water every day. Stay happy. A good mood is actually healthier. Smile more and change your attitude toward eating healthy and regular exercise to one that helps you look forward to both. Enjoy the great outdoors. Getting out in nature has remarkable curative properties. Some people believe that walking on the ground barefooted provides extra health benefits.